This week’s Torah portion, Mishpatim (“Laws”) includes the first covenant in the Torah that is backed up in writing. Yet it is broken sooner than any of the unwritten covenants in the book of Genesis/Bereishit—because one of the covenantal parties is God. brit (בְּרִית) = covenant, pact, treaty. The two men set up a standing-stone and a mound of stones to serve as a boundary marker, a “witness”, and a sign of their brit. Lavan announces the terms: neither man will pass that boundary with hostile intent; and in addition, Jacob will neither mistreat Lavan’s daughters nor take any additional wives. Then each man swears by a different name of the same God. Finally, Jacob slaughters animals, and the two chieftains and their men feast on the mountain. Both leaders carry out the terms of their brit. Each party gives up something that might be in his self-interest (invading the other’s territory) in order to gain something that is definitely in his self-interest (safety from invasion by the other). The terms are reasonable, and the men do not want to violate a treaty made with an accepted ritual in front of three kinds of witnesses: boundary stones, other human beings, and God. A brit with God is not so straightforward. The first two times God declares a brit with human beings, it is really a unilateral promise, with no obligation stipulated for the humans. In the Covenant of the Rainbow, God promises not to destroy the earth with a flood again. In the Covenant of the Pieces, God promises to give Canaan to Abraham’s descendants. Circumcision is the stipulated action for humans, the ritual, and the sign of the covenant, all in one. Jews have performed their part of the brit milah (Covenant of Circumcision) for thousands of years, with or without possession of the land of Canaan, because it is an act of dedication to God—and each infant boy or adult male convert only has to go through it once. In return for obeying all these laws, God promises the people that they will never get sick, their women will be fertile and never miscarry, none of their lives will be cut short, their enemies will run away from them, and they will gradually take over not only Canaan, but all the land from the Mediterranean to the eastern wilderness and from the Euphrates in the north to the Reed Sea in the south. This is the third time God promises to give the Israelites possession of the Promised Land. But it is the first and only time God promises to exempt the people from natural law by making them super-human, with bodies that are invulnerable to illness, infertility, miscarriage, and even accidental death. Such a deal! Moses makes sure this new brit is ratified with elaborate ritual, symbolic reminders, and even a written copy. The blood from the animal offerings is sprinkled both on the symbol of God (the altar), and on the people (or at least the elders in front). The people ratify the brit by shouting “we will do and we will listen”, indicating their willingness to obey not only these laws, but also any future laws God chooses to give them. According to 20th-century commentator Nahum Sarna, the ritual is completed when God gives Moses an even more impressive symbolic reminder: a pair of stone tablets on which God writes the teachings and commandments. The people violate their part of the brit only 40 days later, in the Torah portion Ki Tissa. While Moses is receiving the stone tablets on top of Mount Sinai receiving, the Israelites below lose hope that he will ever return, and revert to their old ideas of God. When Moses comes down, the people are carousing in front of the Golden Calf, in clear violation of the rule against making a god of silver or gold. So the whole elaborate brit becomes null and void, and Moses smashes the tablets. 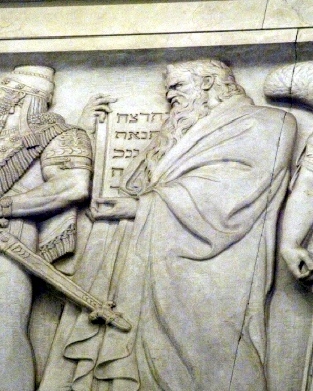 The Ten Commandments are not explicitly mentioned, but most commentators assume they are included in the words Moses carves on a second pair of stone tablets. Later the Israelites make a golden ark, following God’s instructions, and Moses places the tablets inside. The Israelites continue to backslide on obeying God’s rules (though there is no record that they ever cook a kid in its mother’s milk). In the book of Joshua, God does not drive their enemies away, so the Israelites conquer most of Canaan by conventional warfare. Thus the second brit between God and the Israelites is also a failure. Yet the Torah continues to call the ark containing the stone tablets aron ha-brit, “Ark of the Covenant”, and it remains the Israelites’ most revered object until it disappears during the fall of the first temple in Jerusalem. A contract between two humans, or a treaty between two nations, is a practical affair. The obligations of both parties are feasible and spelled out clearly. The proper ritual and witnesses help to enforce the brit. A brit between humans and God is more like a modern marriage covenant. Both parties make lifelong promises without any practical limitations. The ritual, witnesses, symbols, and written documents have emotional importance, but they do not prevent either party from falling short. At some point, a spouse is psychologically unable to be as loving and supportive as he or she intended. At some point, a religious human being is psychologically unable to obey every rule she or he has taken on. And God, at best, appears to operate on a non-human timeline. Sometimes a marriage ends in divorce, and sometimes a brit with God ends in apostasy. But often, spouses pull themselves together and rededicate themselves to their marriage. And often, people seeking God rededicate themselves to the search for morality and meaning. Each story of a brit with God remains a reminder of God’s presence. Even today, the two sets of stone tablets Moses brought down from Mount Sinai loom in our subconscious minds, reminding us that even if full compliance is impossible in a covenant with God, it is still worth dedicating ourselves to the call. Yishar kochech. Beautiful! I always had an image of the covenant at Sinai as a song, each of us hearing it in our own way, as we were able. To this day, if we listen, we can hear the song’s echo in our hearts.